I'm not a Hawkeye fan. I never have been. However, the character and his comics have attracted some amazing creative talent over the years. Hawkeye #19 by writer Matt Fraction and artist David Aja is a prime example of how art can transcend a fandom to advance a cause. 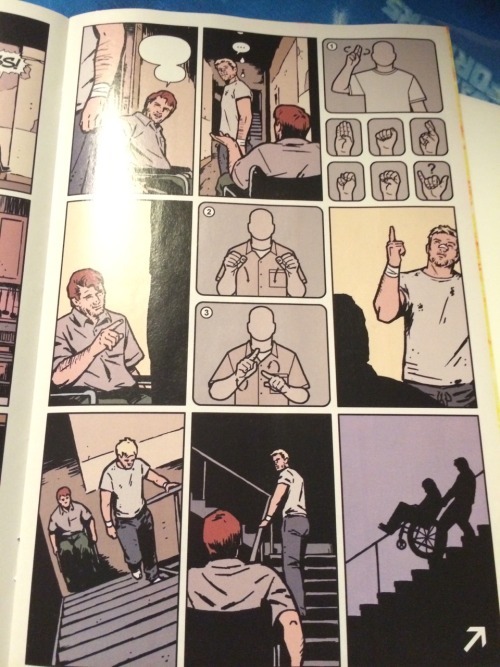 In issue #19, a character's use of sign language is depicted without subtitles, with the dual effect of offering readers unable to read sign an inkling of the frustration that the deaf community experiences in every day life and encouraging curious young readers to learn more about signing. I thought it was very cleverly done, and I've grabbed a copy to read because of it.